Free Fall Decorations Available After Our Festival! The 1st Annual Thunder Mountain Fall Festival is winding down. We are about to enter the final weekend of entertainment and demonstrations, and the last day to enjoy festival activities will be on Tuesday, October 31, aka Halloween. There are only a few more days to enjoy this extra-special fun at Bridal Cave & Thunder Mountain Park. (Although the park is tons of fun even when those things aren't going on!) Once it's over, we have to do something with all of those wonderful decorations we put up. Once our Lake of the Ozarks fall festival is over, we want to repurpose as many of the autumn decorations as possible. They are simply too gorgeous to go to waste once we take them down. That's where you come in. Summer is a popular time to visit the lake area, but fall at the Lake of the Ozarks is an amazing sight to behold! The crisp, cool air has finally made its way to the area, and the leaves are beginning to turn all sorts of gorgeous colors. This is evident all around Bridal Cave & Thunder Mountain Park, but you'll find lots of wonderful spots not too far from us that are a must-see too. This state park is a favorite of locals and visitors alike. It marvelously combines the lake's natural beauty with intriguing history. 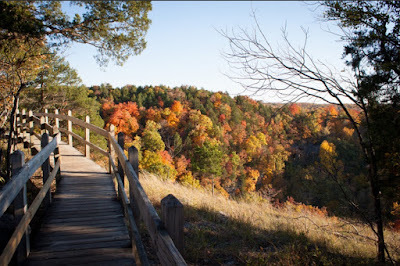 Fall colors abound, and there are a series of trails and boardwalks carved out so you can easily explore for hours. There is a wonderful spring trail to experience, and you can climb the 316 steps to the trails leading to the castle ruins on the bluff, or skip the climb and drive to the trails up top. 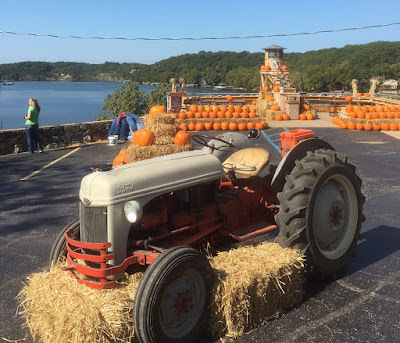 The 1st Annual Thunder Mountain Fall Festival at our scenic family attraction at the Lake of the Ozarks has been a big hit so far, and there are still plenty of great days left in October to enjoy it! Right now at Bridal Cave & Thunder Mountain Park we have over 1,000 pumpkins on site, all looking for a good home. Today we've got a few creative decorating ideas so you can turn the pumpkins you pick into something extra-special. The most popular thing to do with any pumpkin this time of year is to carve it into a jack-o-lantern. 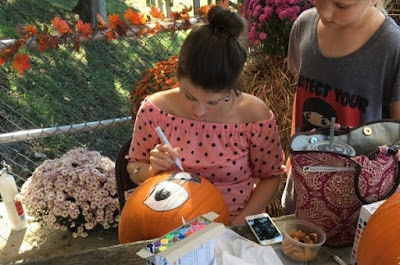 Using simple shapes to carve eyes, a nose, and a mouth are a classic, but if you want to get a little fancier than that, here are a couple of places to find some free pumpkin carving templates. October Fun for the Whole Family at Bridal Cave! Our Thunder Mountain Fall Festival is off to a tremendous start, the decorations and the natural scenic beauty around the park is breathtaking, and we've got tons of fun planned at Bridal Cave all month long! Have you had the chance to enjoy our brand new annual event at the Lake of the Ozarks yet? It adds even more fun and excitement to our family attraction! 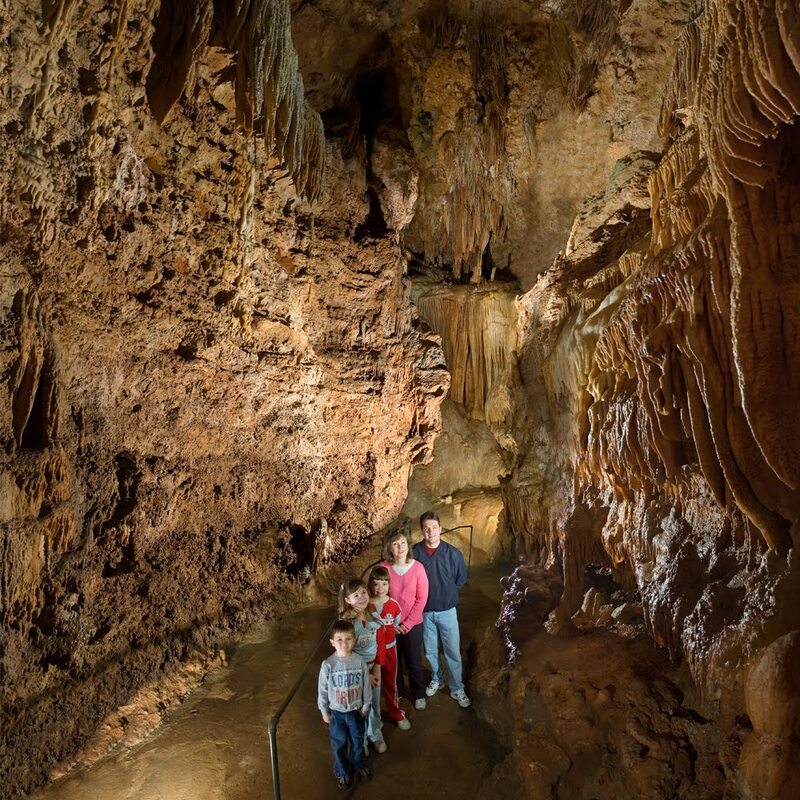 Bridal Cave is well-known as one of America's most scenic cave tours. It remains a constant 60° inside the cave, and you will see room after room of incredible mineral deposits, giant columns, stalactites and stalagmites, massive draperies, and so much more all created over millions of years of formation.